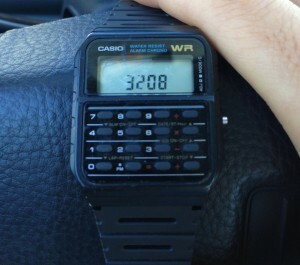 I discovered the diagnostic mode of the Casio CA53W-1 Databank Calculator Watch by pure experimentation. You need to press both set and clear function buttons on the right face of the body while in Normal Time Mode and perhaps the zero button as well. I have not been able to consistently trigger the diagnostic mode due to the finicky business of pressing small buttons and having human hands. Clockwise from the upper left. Cycle through diagnostic mode by pressing the upper button on the right side. Initial screen to check the normal operation of all crystals in the LCD. Buttons to press simultaneously to open diagnostic mode. Needs more experimentation with timing and may require multiple tries with human hands. Second screen to activate half of the crystals in the LCD. 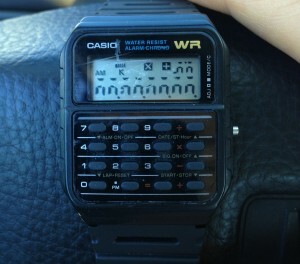 On Casio scientific calculators (such as the FX300) (key combo: SHIFT + 7 + ON), there is another screen in addition to the second one which activates the other half of LCD crystals. Surprisingly, there is not another screen to test the second half of crystals in the watch’s diagnostic mode. The watch is also lacking in a button test screen where normal button operations can be tested. Third screen shows what is assumed to be the firmware version of the watch. 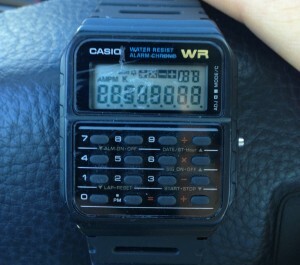 The displayed 3208 matches the model printed on the back of the watch.